When it’s football season but you’re here just for the 7-layer farmer cheese taco dip. Swap out the cream cheese for our farmer cheese to make this quick and easy dip that’s a tastier attraction than the big game. The probiotics found in fermented dairy drinks completely changes the nutritional properties and are particularly important for a healthy gut and body. The misconception that dairy leads to inflammation stems from the belief that consumption of milk with genetically modified growth hormone has the potential to change human hormone levels, but the latest research in 2017 from a study reviewing clinical evidence between dairy products and inflammation could not find sufficient evidence to support the validity of this claim. The claims between inflammation and dairy did not account for poor diet choices, lack of exercise, and stress – which are all potential contributors that may be associated with inflammation-related diseases. Several studies have shown a strong association between the gut-brain-microbiota. Probiotics introduced to the gut have been found to support immunity, improve allergies, and improve digestion. Studies have shown that reduced diversity of healthy gut bacteria during early years is associated with an increase in food allergies during school age years. In addition, kefir made from whole fat milk helps absorb key nutrients such as Vitamins A, D, E, and K. Vitamin K is important because it helps your bones absorb calcium. It’s important to know that kefir contains a special trio: vitamin D, K, and calcium – all three crucial elements to support bone health. A healthy diet is one that is sustainable and full of real ingredients you can pronounce. As always, it’s important to be mindful of how foods react with your individual body but when it comes to selecting which dairy products to consume, going the fermented route is one of the best choices for your health. Kefir can be a beneficial way to incorporate more probiotics into your microbiota. 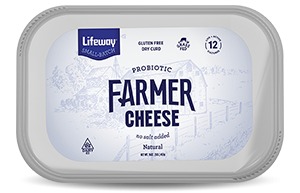 Lifeway Kefir, in particular, may be an appropriate option for those who are lactose-intolerant – it’s up to 99% lactose (a naturally occurring milk sugar) free. Check out our recipe page for versatile ways to use it in the kitchen! Mix the taco seasoning with Farmer Cheese and layer the dip as desired.